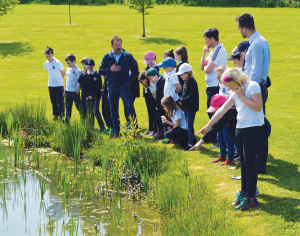 Owners of a picturesque Welsh border caravan holiday home park invited children and teachers from the local primary school to pay a visit during Wales Tourism Week. Pupils of Brynhafren Primary School, Crew Green, between Welshpool and Shrewsbury, spent the morning at Seven Oaks Holiday Home Park where they were given a guided tour before enjoying a picnic in May sunshine yesterday (Thursday). motor-home dealership Salop Leisure and the company’s managing director Mark Bebb and marketing manager Ed Glover joined park managers Ron and Margaret Brace in welcoming the school party. Mr Bebb spoke to the children about the aims of Wales Tourism Week and the importance of tourism to the Welsh economy. He explained that the five star park is popular with people living in the West Midlands who like to escape from urban areas to relax in the beautiful countryside of Mid Wales. He explained that the school and the park had a longstanding relationship, as pupils had planted the first seven oaks there when it opened and then returned to plant more oaks on a new section a few years ago. The trees are now well established. Most caravan holiday homes and lodges on the 40-acre park have views of the River Severn and are bordered by mature trees, banks of shrubs and immaculately kept grass down to the riverside.